Katsura Yamauchi has been active in the free jazz scene in Japan for nearly three decades, playing with notable improvisers such as Otomo Yoshihide, Toshinori Kondo, Misha Mengelberg, Han Bennink, Barre Phillips, and Michel Doneda. 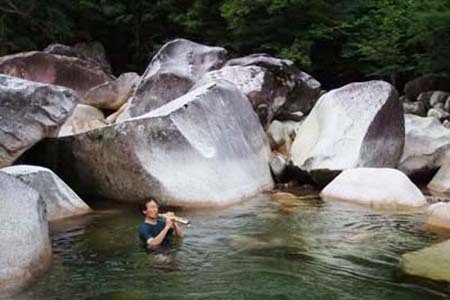 Playing every member of the saxophone family, he is known for his intimate explorations of music in nature – he has made recordings of his playing while almost completely submerged in rivers! For many years a businessman for a very important Japanese company, he chose to retire early with very little security to pursue music exclusively without any regard for compromise. A short interview can be found here. Old Time Relijun frontman Arrington de Dionyso returns to his love of free improvisation with the bass clarinet and multi-phonic throat singing.